The trigger for the mass invasion - the largest mobilisation of British troops since Suez - is widely believed to have been the Bloody Friday bombings by the IRA in Belfast 10 days earlier, which killed nine people and injured over 100. However, the no-go areas - in particular Free Derry, which had been in place since 1969 - had long been a source of embarrassment to the British government. Operation Motorman began six months almost to the day after Bloody Sunday which saw members of the Parachute Regiment murder 14 unarmed civilians during a civil rights march on January 30. It has been suggested that Bloody Sunday was an earlier abortive attempt to retake the nationalist areas of the Bogside, Brandywell and Creggan. 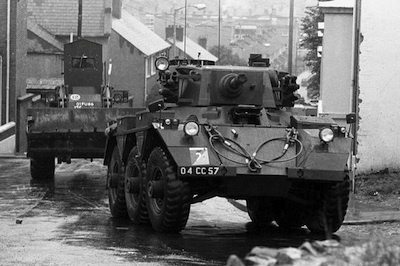 In the days before July 30, about 4,000 extra troops were brought into Northern Ireland. Involved were almost 22,000 soldiers - including 27 infantry and two armoured battalions - aided by 5,300 soldiers from the local Ulster Defence Regiment (UDR). Bulldozers and Centurion tanks were deployed on the streets of Derry to smash through the barricades, and in an extraordinary move Royal Navy battleships were moored off the coast of Donegal ready to shell the Bogside. The operation began at about 4am on July 31 and lasted for several hours. Two people - an innocent teenage civilian and an unarmed Provisional IRA volunteer - were shot dead. The teenager was 15-year-old Daniel Hegarty. He was shot along with his two cousins as they walked along Creggan Heights in Derry. The boys had gone out to see the tanks and watch the operation unfold. Daniel was shot twice in the head from close range by a member of the Royal Scots Regiment and was killed outright. One of his cousins, Christopher Hegarty, survived being struck in the head by a bullet. Nineteen-year-old Provisional IRA member Seamus Bradley was shot, according to the military account, as he stood on the bough of a tree in Bishop’s Field close to Central Drive. The soldier who shot him claimed that Bradley had been armed at the time. But when a group of soldiers arrived to arrest him no weapon was found. This clearly labels Hegarty as a gunman and the smear was compounded in June 2007, 35 years later, when the Ministry of Defence (MoD) released a document that described Hegarty as a “terrorist” and claimed that he was armed. No-one has ever been charged with the killing of Hegarty. An initial inquest in 1973 recorded an open verdict.